Husband and wife team Matt and Sara Morrow can both be found at the Clay County Fair Speedway on Friday nights. However, you’ll never see Sara sitting in the stands or standing in the pits for very long. Instead, she is often in the middle of the track taking picture of all drivers throughout the night, including the family’s 9M car. “It gives her something to do with her nervous energy, and it’s nice to have your own personal photographer follow you around,” Morrow said. She started taking pictures as the pair watched his brother race and took it up a notch when Morrow started driving his own car. He started going to races with his dad as a young kid for a few years until his dad died in 1990, when Morrow was 9 years old. He kept going to races with his brother every so often 7 until his oldest brother, Mike, started racing his own car. Then he would go watch him as often as possible. Morrow has raced all over western Iowa, southwest Minnesota, and southeast South Dakota since he started in 2013. Mike bought a new car and left his old car sitting in his brother’s shop. This inspired Morrow to buy a race suit and helmet and take a spin on the track. After he lost his first race, he was captivated by winning. “I really like going fast and doing things you’re not supposed to do,” he laughed. While he has driven a few different car classes for hot laps, Morrow races exclusively Sports Mods. Part of the reason Morrow does not race more than three times a week is the amount of time he spends on his car. “Just to race one night a week, you’ll spend between six to eight hours a week preparing your car for the different tracks,” he said. In addition to the time, cost and his job also factors into the limitations. 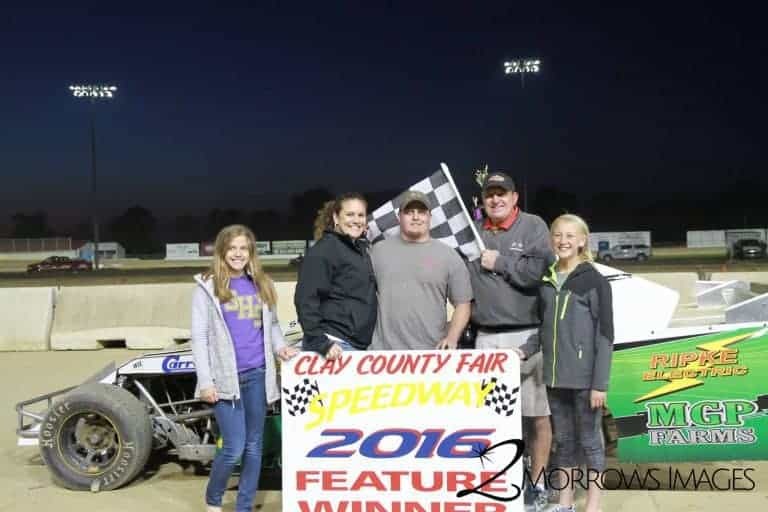 A regular driver at the Clay County Fair Speedway, Morrow likes the clay track. “Everybody is fast on a heavy, hammer-down track, but it makes you think if the track is dry slick.” His favorite feeling is when he can throw the car into the corner and slide through the turns. Even though he thought racing would be a lot of “go fast, turn left”, Morrow discovered that he wishes he spent more time paying attention in geometry class.